Some of the most commonly used plants, both indoor and in landscapes, pose a hidden threat to our pets. That threat could range from mouth irritation and behavioral changes, to digestive distress, to death. In order to protect your pets, it’s a good idea to familiarize yourself with the risky varieties. WHY DO ANIMALS EAT PLANTS? Cats and dogs love to nibble on plants. Often, they use plants to aid in digestion. Sometimes animals eat plants to induce vomiting, to clear their systems of toxins, parasites, bones or fur. Sometimes pets eat plants just because they taste good. We would be hard-pressed to monitor our pets 24/7 to prevent undesirable plant chewing, so it makes sense to eliminate access to dangerous varieties. WHAT PLANTS ARE HARMFUL TO PETS? As I scrolled through Facebook this week, I noticed a photo featuring a store display of potted Easter lilies. Underneath was a note warning consumers against bringing a lily home if there is a cat in residence. Some pet owners have learned the hard way that lilies are highly toxic to cats, causing renal failure, and often death, if any part of the plant is ingested. Lilies do not pose a threat to dogs or humans. While this list is by no means comprehensive, it includes many of the most widely used plants in our homes and landscapes. The Sago Palm, for example, is one of the most dangerous plants for pets. All parts of the plant are toxic for animals, but the seed pod is the most deadly. The toxin, Cycasin, can do its damage in as little as 15 minutes post-ingestion. If untreated, liver failure is imminent. WHAT PLANTS ARE SAFE FOR PETS? Time is of the essence if you suspect your pet has ingested a toxic plant. Identifying the plant is a crucial step in a correct diagnosis. Certain toxins impact specific organs, so the veterinarian will want to run tests specific to those organs. It is important to consult with a veterinarian before inducing vomiting, as that may actually make matters worse. The caustic toxin may damage the esophagus on the way back up. If the animal has vomited, the veterinarian may give the animal activated charcoal to absorb any remaining toxic material in the gut. Lilium has a large delivery radius, which covers most of the Dallas/Fort Worth metroplex. You are as likely to spot one of our signature black vans in south Arlington, Azle, or Frisco as you would in Colleyville or Southlake. However, we do have to draw the boundary lines somewhere. If we are unable to design and deliver your arrangement ourselves, we offer wire services. We know you expect the highest quality, in both design and product, from Lilium. When you need delivery outside our area, we turn to a wire service network that includes florists across the country. These select florists offer a quality and style are similar to our own. In other words, you wouldn’t be sending an “FTD” or “Teleflora” arrangement. When placing a wire order through Lilium, simply provide all of the same information you would if you were placing a local order. You can do this either over the phone, or through our online ordering system. Once we have this information, we will search our network to match your needs with a florist near the delivery location. In the event that location is in a remote area, or one not serviced by a florist in our network, we will let you know right away so that you can make other arrangements. Customers often think that it is much more expensive to wire flowers than to simply call an out-of-town florist directly. That is not necessarily true. Lilium charges a $5 wire service fee. Otherwise, the cost is comparable to a local delivery. It is true that there are some variables that will affect the cost. In New York and California, for example, the flower prices tend to be higher. Delivery fees also vary, depending on the location. While we do not have direct control over the finished arrangement, in-network florists are selected to meet high standards. We will work with the network florist to communicate your specifications, and insure delivery per your instructions. Should there be any challenges with the delivery, we will stay on top of it until delivery is successfully accomplished. Provide a complete address, including a business name, suite or apartment number, and any specific instructions that will help the delivery driver. ALWAYS provide a contact phone number for the recipient. In fact, the wire service will not accept an order without a contact phone number for the recipient. In major metropolitan areas, florists will not even attempt delivery until the recipient verifies that they are present to receive it. Let the florist know what you have in mind, but don’t be overly specific. Allow the floral designer to use their creativity with the florals and greenery that are available to them in their location. What is in season or readily available in one area of the country may not be in another. If you prefer a particular color palette, definitely share that. Specify whether you want a tall or low arrangement. Then let the designer take it from there. Be realistic. Use the gallery on the Lilium website as a guideline. The florists in our network have comparable pricing. Don’t ask for a tall arrangement with a “wow factor” and provide a budget of $75. You will be disappointed. Our staff is happy to guide you through the order to be sure your expectations are met. Most florists in the network must receive the order by 11 a.m. for same day delivery (in the U.S.). Our wire service does encompass many international destinations, including the United Kingdom, Paris, Berlin and Istanbul. Unfortunately, the service does not include Mexico, Central and South America, and the Caribbean Islands at this time. When in doubt, just ask! Delivery fees will vary, depending on the location. Minimum order amounts and pricing will vary as well. You should allow 2-3 business days to process international orders, so plan ahead. Another variation is the style of arrangement. It is most common in Europe to make hand-tied bouquets, without a vase. If you want the bouquet delivered in a vase, you have to specify that, and expect to pay an additional $20-$25. We are pros when it comes to wire orders, and we can help take the guesswork out of the process. While you won’t be sending a Lilium arrangement, we will help you get as close as we can. The Pantone Color Institute has declared the color of the year for 2019: Living Coral. The vibrant, yet soothing shade is thought to represent our ever-changing environment. Look for the warm, salmon pink shade to pop up in home decor, apparel and accessories, cosmetics, housewares and paint colors. The Pantone Color Institute has been selecting a single color of the year (with the exception of 2016 when two colors shared the honor) for the past 20 years. Their selection is based on careful trend analysis. They explore the entertainment industry, world-wide art collections, fashion, design, and trending travel destinations. They also consider modern lifestyles, recreation trends, and socio-economic conditions. This year, they clearly give a nod to the environment, calling attention to the preservation of our coral reefs. The Institute’s color choice also takes into account new technologies, materials, textures, and relevant social media platforms. They carefully monitor heavy hitters in the advertising world, like Apple and Airbnb, to provide hints as to trends on the rise. Airbnb’s recent advertising campaign, shown here in a subway car, features a background very similar to Living Coral. 2018’s designated color of the year, Ultra Violet, influenced wedding florals throughout the year. Greenery, the 2017 winner, impacted wedding trends in both color and use of natural materials. We expect Living Coral will do the same. In the floral world, the shade can be found in a variety of blooms: roses, dahlias, tulips, gerbera daisies, and peonies to name a few. Living Coral pairs well with both light and dark colors. In floral arrangements, it is complemented beautifully by green foliage. It is equally at home with pinks and whites, or with fellow warm colors like yellow or orange. Living Coral pops against almost any shade of blue, particularly turquoise. Coral anthurium sits front and center in this vibrant arrangement. According to Pantone’s website, “Symbolizing our innate need for optimism and joyful pursuits, PANTONE 16-1546 Living Coral embodies our desire for playful expression.” Lilium agrees with their joyous assessment. We receive a variety of fresh flowers weekly, including blooms in the coral palette. We look forward to finding creative ways to incorporate this year’s Pantone Color of the Year into our fresh arrangements. Whether you are planning a large party, or a small gathering, the table decor needn’t cause any stress. While floral centerpieces are beautiful, you can create a tablescape with or without flowers, often using items you already own. A tablescape, by definition, is simply an artistic arrangement of items on a table. The tablescape can convey a theme, celebrate a season, or just provide a personal touch. The items you choose do not have to match, but should complement each other. Items you already have, or that can be easily obtained, make tablescapes a snap. You can use empty bottles or jars, petite potted plants, lanterns and other decorative objects like baskets, frames and mirrors. Candles of all sizes perfectly complement most arrangements. If you are celebrating a holiday, incorporate items to enhance that theme or season, such as ornaments, pine cones, pumpkins, berries, leaves and greenery. Dress up your holiday table with colors and textures of the season. Plentiful nuts, gourds and leaves make perfect accents. A simple, yet festive tablescape made with Mason jars, cranberries and fresh greenery. Mix and match bottles and vases you have on hand, and fill with individual stems for a pop of color. The most effective tablescapes feature items of various heights. The tallest item will be the focal point. Once that piece is selected, mix and match items of varying heights, colors and textures to create interest and dimension. A little imagination and a few minutes is all it takes to design an inviting table for your special guests. There is everlasting love and everlasting life, but sadly, there is no such thing as an everlasting flower. If there is any downside to purchasing fresh cut flowers, it is the fact that they are perishable. Fresh flowers are so beautiful, we want them to stay that way as long as possible. While there is no method that will make your flowers everlasting, there are some tips that will make them longer lasting. When a flower is growing in the ground or container, the sun is its friend. But the moment a flower is cut, the sun and flower are no longer on speaking terms. Sunlight speeds the deterioration of cut flowers. Place your fresh arrangement in a cool location, out of direct sunlight. In addition, make sure your flowers are not sitting directly under an air vent. If you have a boutonniere or corsage, store it in the refrigerator away from fruits and vegetables. An apple a day may keep the doctor away, but it makes fresh flowers sickly. Fresh fruits and veggies emit ethylene gas, which speeds up the aging process for flowers. If you are putting cut flowers into a vase, start with a fresh cut on all stems. Trim stems at an angle using sharp scissors or a sharp knife. This will help them draw water up the stem more easily. Floral stems have capillaries that are used to draw in water. If you use a dull blade to trim stems, you are squeezing the capillaries closed, preventing the flow of water to the flower. Start with clean water and a clean vase. Many internet sites will advise adding various elements to the water, including aspirin, sugar, bleach, vinegar, or even a penny. If you purchased your flowers locally, however, the chances are your flowers have already been treated with a natural flower food and do not benefit from any of these additives. If you receive an arrangement already in a vase, be sure to top off the water daily, making sure all stems are submerged in the water. For best results, pour out the water and completely replace it with clean water every two-three days. At Lilium, we are often asked how long a customer can expect their flower arrangement to last. In general, five-seven days is what you can expect. Anything beyond that is a bonus. There are certain varieties, however, that are longer lasting than others. Lilies and orchids are among the varieties that stick around for a while. Tropical flowers, like ginger, heliconia, pincushions, and birds of paradise can last up to two weeks. Hydrangea is one of the most popular blooms used in fresh arrangements, but tends to be high maintenance. One of its unique characteristics is that it drinks from its petals as well as its stem. If you have a hydrangea that looks sickly, try submerging it (head and all) under water for a few minutes and it will perk back up. There is a misconception that roses do not last very long. If you purchase premium roses that are cut at maturity, they will last longer. Roses cut too early will not open consistently, and their heads will droop. Lilium uses Corazon roses from Rio Roses. The Corazon is an award-winning Blue Ribbon rose with a proven track record. The blooms open 4″-5″ inches across, but in spite of the impressive show, the heads will not droop. Lilium believes that educating consumers about properly caring for their arrangement or plant is an important step. We want customers to be satisfied with their purchases, while being realistic in their expectations of a perishable product. On every Lilium arrangement, potted orchid or plant, a care card is attached. In addition, care instructions are printed on the back of our message cards. We can’t prevent the demise of a cut flower, but we can work together to prolong its life. This blog has nothing to do with flowers, but as a florist, we work day in and day out with brides, party and shower hostesses, and event planners who all rely on the ever-important (but often neglected) RSVP. Just consider this a public service announcement: RSVPs are important! Everyone who has hosted an event can relate. The non-RSVPers wonder, “what’s the big deal?” You know who you are. Let’s focus on why it is a big deal to RSVP when it is requested. This applies to weddings, showers, parties, and any event where RSVP appears on the invitation. It isn’t simply a matter of etiquette, or an antiquated concept; it has very practical implications. In our business, we hear stories of frustration over getting a reliable head count. Brides and their parents are working with a budget. If they serve a meal, they have to give a count to the caterer. They have to tell the venue how many tables and chairs are needed. The list can go on to include china, glassware, linens, centerpieces and a multitude of rented items. Likewise, party hostesses are purchasing food, beverages, and party favors, and planning things like seating and activities with no idea how many will attend. In some cases, a host makes lodging and transportation arrangements for potential guests from out of town. As you can imagine, it is difficult to successfully plan without a commitment from the guests. I’ve asked myself why people seem to disregard an RSVP request. Is it a generational thing? Is it reluctance to commit? Too much trouble? I can’t really blame this one on the Millennials. No one seems immune. It isn’t a time-consuming task. In most cases, hosts make it pretty easy to RSVP. In the case of less formal invitations, like E-vites and Facebook events, it is as simple as the click of a mouse. Printed invitations almost always include a response card, as well as a stamped and addressed envelope for mailing. Short of making personal phone calls and text inquiries (and I know some who have had to resort to this), what does a host have to do? That leaves the commitment excuse. “I’m just not sure what I will be doing three weeks from Saturday, so I just won’t commit. If it turns out I’m free, I’ll make an appearance. If not, they won’t be expecting me.” Make no mistake, an RSVP is a commitment. Anyone who has planned a wedding knows the angst of creating a guest list. Tough decisions are made. Distant cousins twice-removed are crossed off, while Uncle Jim and his plus-one make the cut. If you were so fortunate as to make the cut, Répondez s’il vous plaît (RSVP). Make the commitment, take the plunge, show up. Put it on your calendar and protect that date. If you have a conflict, decline promptly, or send your regrets. You aren’t required to give an explanation, but you might offer a brief note expressing gratitude for the invitation and indicating the reason you are unable to attend. E-vite and Facebook invitations allow you to straddle the fence with a “Maybe” response option. Whenever possible, however, make a decision and let the host know. You just might open up a spot for one of those distant cousins who is dying to attend. I am dating myself with this bit, but “back in the day” when I got married, the ceremony was in the church sanctuary followed by a reception in the church’s fellowship hall. Yes, we requested RSVPs on the invitations, but it was just to have a ballpark estimate of how many to expect. How many did my cake need to serve? How many cups of punch would we need? It didn’t really matter if someone brought an extra guest or two along. Today’s weddings are a little (a lot) more complex, from venues to menus. For reasons previously mentioned, it is imperative to have an accurate count of guests. Apart from the price tag attached to each guest, the bride and groom have chosen the friends and family they want with them on their special day. Respect that. The names on the invitation envelope are the parties invited. Period. If your name is the only one that appears, you are going solo. For some this may seem like common sense; for others, it may as well be Greek. So, it bears pointing out. Don’t assume they are fine with you bringing your children along. If your invited spouse or date can’t make it, don’t feel free to substitute another guest. Don’t put them on the spot and ask if you can bring your sister who happens to be in town that day, or worse yet, just bring your sister without asking. There will be no place card at the table with her name on it. Awkward! Perhaps your invitation will be addressed to you “and guest.” In that case, by all means, bring a date or a friend. The host has graciously allowed you a plus-one. Everyone. Even if you are part of the wedding party, you need to RSVP. If you verbally told the host over lunch two weeks ago that you planned to attend, you still need to RSVP. Never assume the host knows you plan to attend. You don’t have to read up on your Emily Post Rules of Etiquette, or seek the advice of Dear Abby or Miss Manners. You don’t need fancy words, or creative writing skills. It’s as simple as “yes” or “no,” “accept” or “decline.” Check a box or click on the screen. At the end of the day, it’s really a matter of showing respect and courtesy to the host/hostess, who was kind enough to invite you to join in their celebration. The ’80s called and they want to back in. No problem! Who doesn’t love a good throw-back? This year, look for a number of wedding trends that pay homage to the past… like, totally. If you are old enough to remember 1981, chances are you were parked in front of a television watching Lady Diana Spencer marry Prince Charles in July of that year. Diana’s wedding style sparked trends across the bridal industry, including puffy sleeves, mile-long trains, cathedral-length veils, and the cascading bouquet. Today’s version of the cascade bouquet is less structured, more haphazard and “undone.” The cascade effect can be created with flowers or greenery, including ivy, trumpet vine, eucalyptus, berries, jasmine or wispy ferns. There is another royal wedding just weeks away. The highly anticipated event is sure to ignite a number of bridal trends. Stay tuned! Garden flowers that might be considered old-fashioned are in vogue. Showy and versatile dahlias are replacing peonies as the “it” flower in bridal bouquets and arrangements. Zinnias and chrysanthemums also make the list. Chrysanthemums, often associated with autumn, are available year-round in a variety of colors. Brides are selecting blooms that convey a fresh-picked from the garden appearance. Most garden-style flowers are locally-sourced, which make them an economical option as well. Martha Stewart Weddings’ bouquet features two trends: cascading design and dahlias. Bright zinneas give traditional roses and hydrangeas a more organic, garden-style vibe. Wreaths and flower crowns are back, with a modern twist. You can still use wreaths as door decorations, but there are many other uses. Floral wreaths encircle the wedding cake, accent light fixtures, and serve as aisle markers. Flower crowns are not just for the flower girls. Brides have adapted the trend for their own wedding day look. Some opt to wear them as headpieces, while others carry them in place of a traditional bouquet. Don’t forget the pets! Our furry friends can be as festive as the rest of the bridal party with a coordinating floral collar. Although elements of the ’80s are circling back around, few brides want a full-blown, “to the max,” retro wedding. Pick and choose among the trends to give a subtle nod to the era. Today’s brides are embracing the past, but putting a fresh spin on these old favorites. If you are planning nuptials in the coming year, let Lilium help you incorporate the latest trends into your special day. The holidays are barely behind us, but we are headed full-steam toward Valentine’s Day. In the world of sports, all eyes turn to the Super Bowl February 4 and the Olympic Games on February 9. In the flower game, however, the biggest event of the year happens a few days later on February 14. Whether you mark the day with cards, flowers or candy, Valentine’s Day is one of the most anticipated (and sometimes dreaded) days of the year. In honor of the big day, we thought we’d share a few fun facts about Valentine’s Day. There was more than one Saint Valentine, but the one most associated with Valentine’s Day is the one who defied Emperor Claudius II by helping couples to marry in secret. The emperor felt single men made better soldiers, and forbade them to marry, but Valentine was sympathetic to their plight. Valentine’s actions cost him his head, but he is immortalized centuries later as we celebrate love. Isn’t that romantic? Nothing takes you back to those classroom Valentine’s Day parties like a box of conversation hearts. Invented in 1866, Necco (New England Confectionery Company) now produces 8 billion conversation hearts each year. Production continues year-round to meet the February demand. Each box contains assorted messages (50-60 different ones are produced each year), including current references like, “IM Me.” If you have a few boxes left once Valentine’s Day has passed, don’t worry. They have a shelf life of five years! Vernona, Italy, home of William Shakespeare’s fictional lovers Romeo and Juliet, receives approximately 1000 letters addressed to Juliet each year. Letters to Juliet are answered by members of the Club di Guilietta, who take their task very seriously. Overall, $18.2 billion is spent on Valentine’s Day each year. The average man spends $150; the average woman spends $74. Approximately 9 million people will purchase a Valentine gift for a pet. Hallmark began mass-producing Valentine’s Day greeting cards in 1913. Today, approximately $1 billion is spent on Valentines, making it the second largest card-giving occasion, behind Christmas. According to Hallmark, 50% of the US population purchases Valentine’s Day greeting cards. Of that number, half are purchased in the six days prior to February 14. Procrastinate much? Chocolates are a favorite gift choice for Valentine’s Day. We often see those heart-shaped boxes on retail shelves before the Christmas clearance signs even go up. Why chocolates? Historians tell us that physicians in the 1800s advised their patients to eat chocolate to calm their pinings for lost love. Chocolate increases the brain’s level of serotonin, the feel-good chemical. In the mid-1800s, Richard Cadbury produced the first box of chocolates specifically for Valentine’s Day. He designed the heart-shaped boxes himself, adorned with roses and Cupids. Whether we purchase the chocolate to celebrate love, or mourn the lack of it, Americans spend $1 billion on Valentine’s Day chocolates each year. Flowers remain the most popular expression of Valentine’s Day affection, with red roses topping the list of romantic blooms. Americans will purchase 220 million stems of roses for their Valentines this year. 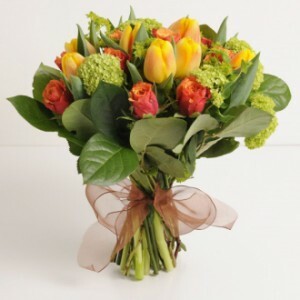 The tradition of sending flowers comes from a custom of using non-verbal methods of communication. Looking back to the 1800s once again, specific flowers were assigned meanings to convey certain sentiments. Years later, we still honor many of the sentiments attached to our favorite blooms. The classic red rose symbolizes love, beauty, romance and perfection. Tulips stand for perfect love. Peonies are most often associated with romance and bashfulness, with some believing they bring good luck. Corazon roses from Rio Roses, premium blue-ribbon roses, are known for their large, long-lasting blooms. Tulips from Holland represent perfect love. Fan-favorite peonies are not officially in season, but a few lucky florists will have them in stock. Weekday Valentine’s Days are the busiest for florists, as people take advantage of sending flowers to their loved ones at work. With Valentine’s Day falling on Wednesday this year, consider sending an arrangement early in the week. You will get the best selection of flowers before the rush, and the recipient will be the first in the office to receive flowers (making them the envy of their co-workers, and making you the hero). Whether you are celebrating with your sweetheart, or celebrating single-hood, have a Happy Valentine’s Day! The color experts at the Pantone Color Institute have named their Color of the Year for 2018: Ultra Violet. The annual announcement is much-anticipated by designers, manufacturers and trend watchers throughout the country. The chosen color influences fashion, cosmetics, and all things for the home, from paint to textiles, furnishings to florals. Ultra Violet (Pantone 18-3838) is a celestial shade of purple, that falls on the cooler end of the spectrum. It calls to mind the vastness of the galaxy and all its mysteries. Pantone is synonymous with color for a vast array of industries, but it started in the printing industry. They developed an innovative color matching system in 1962, including a swatch book, that ensures colors chosen would match from one print job to the next. The idea spread to include other industries, including plastics, digital technology, fashion and home. As the existing standard for accurate color communication, their color of the year selection becomes more influential with each passing year. Ultra Violet dominates graphic design and packaging. When choosing the annual color of the year, Pantone experts consider influences from fashion, film, technology, art and travel. They visit venues and events all over the world, including art shows, auto shows, and world events like the Olympic Games, making note of how color is being used. Pop culture also influences the choice. For example, musical icons Prince, David Bowie and Jimi Hendrix have often been associated with shades of purple. The color evokes creativity and originality. It is also associated with royalty, wealth and complexity. In the floral industry, purples are popular for all occasions, but there is definitely a trend toward purple for weddings. Flowers in shades of purple are available in abundance, and, as you can see from the suggested palettes above, they pair well with many other hues a bride might want to include. Ultra Violet can be incorporated into floral arrangements for any occasion. It can be either masculine or feminine, so it is a very versatile color. Flowers that capture the spirit of the 2018 Pantone color of the year include calla lilies, hydrangea, dahlias, lisianthus, zinnias, asters, roses, scabiosa, lilacs, chrysanthemums, delphinium, hyacinth, orchids, stock, violets and tulips. Stop by Lilium or visit our website at www.liliumflorals.com to explore your passion for purple, and visit the Pantone Color Institute website at www.pantone.com to read more about this year’s pick.